Based on reviews from 7 experts and 5,328 users. Learn how our rankings work or see our guide to Adidas turf football boots. Updated Apr 2019. Coined by the legendary footballer, Pele, as the beautiful game, one can see the reason why football is a much-loved sport. The game not only brings people together, but it also exposes players to different environments as it can be played literally anywhere. Varying surfaces from icy grounds needing soft ground shoes, indoor plays that require grippy flat-soled cleats, and even turf ground surfaces that are designed to mimic grass are just some of the courts that one can play in. It is apparent that football is a multi-faceted sport. For a complex sport like football, it’s unsurprising to know that it is always evolving. Upgrades in equipment are inevitable and football behemoths like Adidas or Nike are happy to keep up. With recent developments like professional games switching to turf courts, the three stripes has made sure to keep up by releasing quality Adidas turf football boots. Turf (TF) courts which are also called artificial turf is a type of football court surface meant to mimic natural firm grass surfaces. Created out of synthetic grass, this court type provides several benefits including a consistent surface all year round with minimal maintenance needed. What is a turf football boot? Each type of soleplate is specifically designed to work in specific court types. Firm ground football boots usually incorporate a blend of conical and bladed studs, indoor football boots are designed to be close to the ground and deliver traction for polished surfaces, etc. The same goes for turf football boots. The soleplate of turf cleats is usually created with a rubber outsole to maintain grip while a variety of stud patterns are integrated into the sole to promote grip. The stud pattern, of course, is highly dependent upon the brand. Several brands, including Adidas, offer turf football boots. Turf shoes from the brand come from several of the notable silos which include Adidas Tango, Nemeziz, Predator, and the X line. 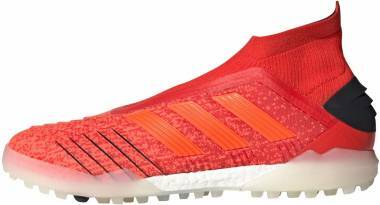 Bringing a bandaged type upper which is apparent in the Adidas Nemeziz line is the Nemeziz Tango 17+ 360 Agility Turf shoe. 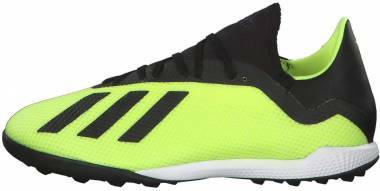 This Adidas turf football boot brings a virtually barefoot experience to its wearers as the material is designed to be lightweight and thin resulting to a foot-hugging sensation. The traction on turf courts is brought about by the shoe’s Torsion Frame outsole. The soleplate consists of short-bladed studs that bring traction and grip for players on the pitch. Engineered to cater to quick direction changes and acceleration. The Adidas X Tango 18+ Turf delivers a striking colorway through its Superthin Speedmesh upper that brings a lightweight feel to its wearers. The outsole, which is designed for turf grounds, is created out of perforated light material. Additionally, the cushioning system comes in the form of Boost which brings a comfortable feel for the shoe. The outsole is composed of a perforated material which ensures grip on turf courts. The Adidas Copa Tango 18.1 Turf is a modern rendition of a much beloved Copa football boot. Sporting a traditional design known from the Copa line, it has a black and white colorway with splashes of red bringing a more modern feel for the shoe. The Adidas logo is evident on the lateral side of the shoe, creating a stark contrast from the primarily black upper. The outsole of the shoe is created with high-quality rubber that ensures traction and grip on turf ground courts. An unusual-looking cleat, the Adidas Nemeziz Tango 17+ 360 Agility Turf football boot is not for the players looking to blend into the background. Sporting a standout Energy Blue, Solar Yellow and Legend Ink colorway, this Adidas turf football boot has been infused with the bandaged look also known as Adidas’ 360 Torsion tape system which is what the Adidas Nemeziz line is known for. This look, however, is not only for aesthetic purposes as this element is engineered to hug the player’s foot bringing a genuinely barefoot sensation to wearers. Torsion technology has been incorporated into the outsole which accommodates acceleration and rapid speed changes for players in turf courts. Control is key when thinking about the Adidas Predator Tango 18+ Turf football cleat. Created with a Boost midsole, this Adidas turf football boot excels in bringing comfort to its wearers. Control comes in the form of a knit upper which hugs the player’s foot, bringing support from the heel to the toe area. Playing in wet courts isn’t a problem as well, as this model features Controlskin technology which ensures grip despite poor weather conditions. The setup in the outsole is a stud configuration that optimizes rotation, traction, and stability in turf surfaces. While the Adidas Predator Tango 18.3 Turf football boot is a low-tier model, it doesn’t mean that you’d have to put up with a low-quality cleat. This couldn’t be far from the truth as this mid top pair is infused with numerous Adidas turf football boot technologies that add to each wearer’s soccer experience. The upper is created with a Primemesh material which brings structure to the cleat while maintaining an excellent fit. Furthermore, an embossed feature affords a better grip. Comfort is a guarantee for the Copa Tango 18.1 Turf as it sports a much-coveted kangaroo leather upper. The natural leather is highly prized for how soft it is as well as its moldability. Integrated into its construction is Adidas’ X-Ray vamp cage which brings the player’s foot closer to the ball, which in turn brings a better ball touch. An anti-abrasion outsole is also used for this model. Primeknit - Primeknit is the answer when players ask for knit in Adidas’ turf football boots. The construction of this material entails digitally knitting the upper resulting in a one-piece construction. This fused-yarn setup also allows for flexibility, support and maintaining a lightweight feel. The Predator Tango 18+ is an example of an Adidas turf football boot with this type of technology. 360 Torsion Tape technology - Prominent in the Nemeziz line is Adidas 360 Torsion Tape System. Inspired by the act of wrapping bandages over athletes’ bodies before a performance, the material not only brings a unique design, but it also wraps the wearer’s foot bringing a barefoot feel for players. An Adidas turf football boot with the Agilityknit technology is the Adidas Nemeziz Tango 17+ 360 Agility Turf. Climalite - Combining the best characteristics found in synthetics and fabric to create a new material is what Adidas did when they created Climalite. 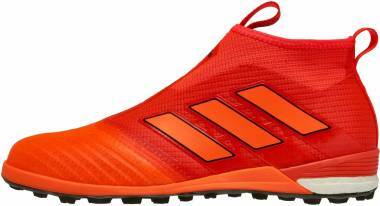 This Adidas turf football boot element is specifically designed to adapt to warm environments. This fusion of materials brings about a soft feel while maintaining breathability for the wearer’s foot. Hydrophilic properties are also evident in Climalite as it is engineered to absorb sweat unto itself and away from the player’s foot. The Adidas turf football boot featuring this technology is the Adidas Mundial Team. X-ray vamp cage - A feature most apparent in the Adidas Copa Tango 18.1 Turf football boot is Adidas’ X-ray vamp cage system which brings the foot closer to the ball, affording wearers a better ball touch. The snug fit that this element delivers also ensures that there is minimal internal foot slippage, reducing the probability of developing blisters. Ethel Vinyl Acetate (EVA) midsole - A cushioning system usually found among Adidas indoor and turf football boots is a die-cut EVA material. 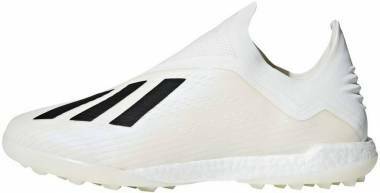 Adidas turf football boots with this type of cushioning include the Adidas Mundial Team shoes, X Tango 18.3 Turf, Adidas Kaiser 5 Team, and the Adidas Copa Tango 18.3 Turf football boots. Boost - Bringing cushioning to the next level is Adidas’ Boost cushioning system. While the material is still created out of the usual Thermoplastic polyurethane (TPU) commonly used in Adidas turf football boots, the ingenuity comes from its construction. Instead of using a one-piece material, Boost is created out of hundreds of TPU capsules that have been expanded and joined together. This setup allows for more energy return, creating more bounce in a player’s movements. The Adidas turf football boots with Boost as its cushioning system are the Adidas Copa Tango 18.1 Turf and the Adidas Predator Tango 18+ Turf. Traxion technology - Traxion technology is one other feature that’s prominent in Adidas turf football boots. This technology has been developed by the brand to provide optimal grip even during directional changes without putting additional stress on the wearer’s foot. Adidas turf football boots with this technology include the Adidas Mundial Team and the Adidas Kaiser 5 Team. Rubber outsole - A rubber outsole is a basic element for turf and indoor football boots. This comes as no surprise as the material is well-known for its gripping ability. While this material is ubiquitous in turf football boots, there are also rubber-based outsole materials that have non-marking characteristics that are quite useful for polished indoor surfaces. 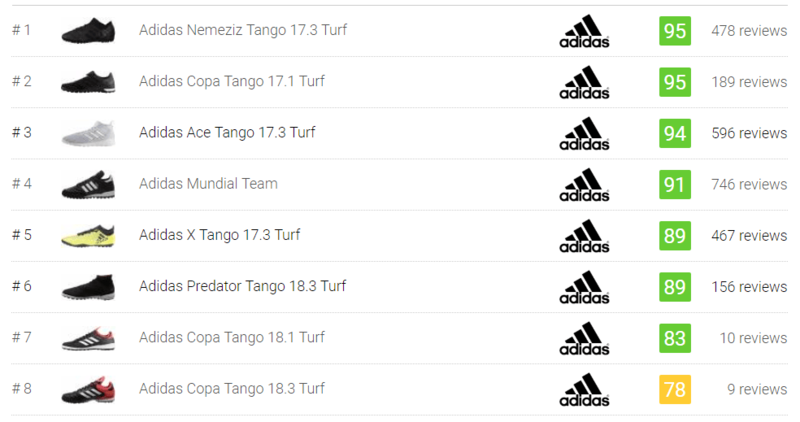 Some of the Adidas turf football boots with a rubber outsole are the Adidas Copa Tango 18.1 turf, Nemeziz Tango 18.3 turf and Nemeziz Tango 17+ 360 Agility turf. Limited edition releases are almost always a joy to watch as it allows brands to collaborate with celebrated football players or even create designs for tournaments. A good example for this is Adidas’ turf football boot launches. The brand has made quite a formidable selection of limited edition cleats that prompted the market to flock to their stores, selling out thousands of pairs worldwide. The bar was set high for this limited edition Adidas turf football boot release as it is for the exemplary Adidas Mundial shoe. The Adidas Mundial Team ‘Modern Craft’ showcases two elegant colorways. One features a Core Black and Gold Metallic color palette that offers a traditional but menacing feel. A White and Gold metallic model shortly followed suit. The devil is in the details for the Adidas Ace 17+ Purecontrol UCL Dragon limited edition model. 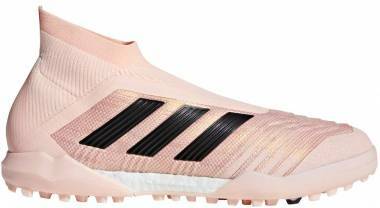 While this Adidas turf football boot looks conventional compared to other limited edition Adidas designs, knowing the design inspiration for the shoe along with the design details found on the cleat would help one appreciate it more. The primary color palette of this cleat includes blue, black, and white. Taking a closer look at the upper, one can see why a dragon is in the boot’s name. Graphic scales are apparent as it is an homage to Cardiff’s coat of arms which features a red dragon. The heel area up to the football boot’s Purecut sock collar is predominantly black. Cushioning comes through the Boost midsole. A pristine colorway comes in the form of the Adidas Copa Tango 17.1 Crowning Glory football boot. This model features a primarily white upper with gold detailing which includes the toe cap, the ‘COPA’ lettering and the ankle area with the Adidas logo. This Adidas turf football boot also sports a kangaroo-leather upper with synthetic elements and a central lacing system with a fold-over tongue, keeping that traditional look. A blue and black combo has been used to establish the aesthetic of the Adidas Copa SS Kamo 50th Anniversary model. This Adidas turf football boot’s design was inspired by the 1968 La Plata model which is a classic. The pair was set up to become a very rare collector’s item as only 80 pairs were created. Other versions for different court types were also launched including hard ground and trainer models. This stunning green Adidas turf football boot was inspired by the EQT range which was released in the 90s. The shade of green used is distinct as it has some blue overtones. Contrast is created by using black elements in the collar area and a standout three stripes logo which is colored white. The soleplate has not been placed in the backseat as well, as it still pops out with the use of white rubber. A wide variety of Adidas turf football boots have been made available by the brand coming from their varied collection. As there isn’t singular perfect football boot for everyone, one should have a general guideline on what to look for regarding fit, pricing, and several other factors. One of the most important aspects to consider in buying Adidas turf football boots is the fit. Contrary to when one is purchasing a pair of sneakers, choosing a pair of football cleats means going for a much more snug fit as this helps facilitate a better ball touch. Although, it is also important to allot a little wiggle room for the wearer’s toes. The ideal space should be about ⅛ to ¼ inch. Additionally, it is important that there is minimal internal foot movement to avoid developing blisters. The price is another important factor to consider in buying a pair of Adidas turf football boots. It is a common misconception that the higher the price, the better the boot is. While this might be true for some cleats, this is not necessarily the case as there are low-tier turf football boots that hit the right spot when it comes to price and quality. Hence, it is important to put some time in researching about football boot models that one is considering. Adidas turf football boots have a wide range of models to choose from ranging from top-tier, mid-tier to its low-tier models from several of their collections. The weight of a turf football boot is one other element to consider when buying a pair. If one values speed and acceleration, it is essential that a wearer looks for a football boot that is not as heavy. The lightest weight for a football boot is about 5 ounces while the heaviest is 11 ounces. The average weight for a football cleat is 9 ounces. A wide selection of lightweight Adidas turf football boots are available which includes the iconic Mundial Team. What Adidas collections offer turf football boots? Several of Adidas’ collections offer turf football boot models. These include the Tango, Nemeziz, Predator and the X lines. Is AstroTurf similar to artificial turf? AstroTurf is a brand that specializes in the creation of artificial turf. The brand has become a household name and has been synonymous with artificial turf; hence, it is usually interchanged with the other. Can one use indoor football boots on turf courts? While it is not ideal, one can still technically play on turf courts using indoor football boots. With this, it is important to note that the wearer will not be afforded the amount of grip that turf football boots have on turf courts. Turf football boots usually feature a soleplate that is composed of low-profile studs traditionally made from rubber. This setup is engineered to promote traction on turf courts. Indoor boots, on the other hand, have flat soleplates created with gum rubber to optimize grip on polished indoor surfaces. What are the benefits of using a kangaroo leather upper? It is no secret that kangaroo leather is a highly sought out material in the construction of football boots. This is no accident as the material has a lot of attributes that are ideal for the construction of football cleats. For one, this natural leather brings a soft feel to its wearers. Moldability is also a benefit as the material stretches over time, bringing a genuinely personalized fit for footballers. 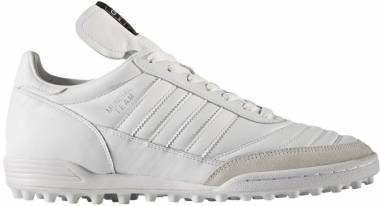 There are several Adidas turf football boot models that sport a kangaroo leather upper. A notable example is the Adidas Copa Tango 18.1 Turf.